One of the best places in the world to watch planes land is on the island of St. Martin in the Caribbean. St. Martin is a 35 square mile area island with mountains in the center and beautiful white sand beaches at the water’s edge. The northern half of the island is owned by France and called Saint Martin. The south side is part of the kingdom of the Netherlands. The Dutch call it Sint Maarten. 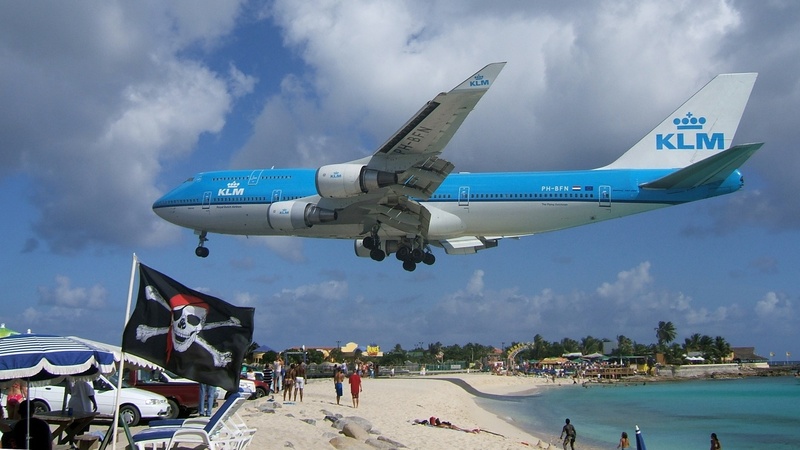 This beautiful island is served by Princess Juliana International Airport (SXM) on the Dutch side. Princess Juliana is without a doubt the best place in the world to watch airplanes land and the best place to set up for fantastic pictures of the world’s largest airliners landing is the sunset Beach Bar and Grill on Maho Beach. Boeing 747’s and the Airbus 380 cross Maho Beach at approximately 50 feet over sunbathers and swimmers for some fantastic aviation photo opportunities. The landing runway, runway 10, is only 7,150 feet long and the touchdown area is only a short distance from the ocean waves. On the departure end of the runway is Pic Paradis, a 1,390 feet high mountain that departing aircraft must avoid with a sharp right turn after takeoff. Water on one end and mountains on the other end of this short runway is what places Princess Juliana airport on the list of the world’s most dangerous or extreme airports. Pictures and video from this spot often surprise viewers with how close people are to these flying behemoths crossing the beach. These pictures are recognizable across the world. The other shocking images are of tourist and sunbathers hanging on the airport fence just behind departing jets as pilots hold the brakes and throttle up the engines for the short run down the runway. Tourists hold on for dear life while being pounded by hot blast from jet engines. With the larger airliners this can or will lift them off the ground as they cling to the fence. Unfortunately this can be a very dangerous sport. A few misfortunate fence riders have been severely injured by jet blast. 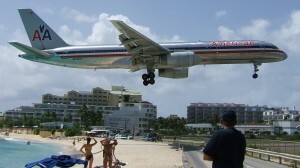 If you make it to St. Martin make sure you spend some time on Maho Beach and don’t forget your camera. 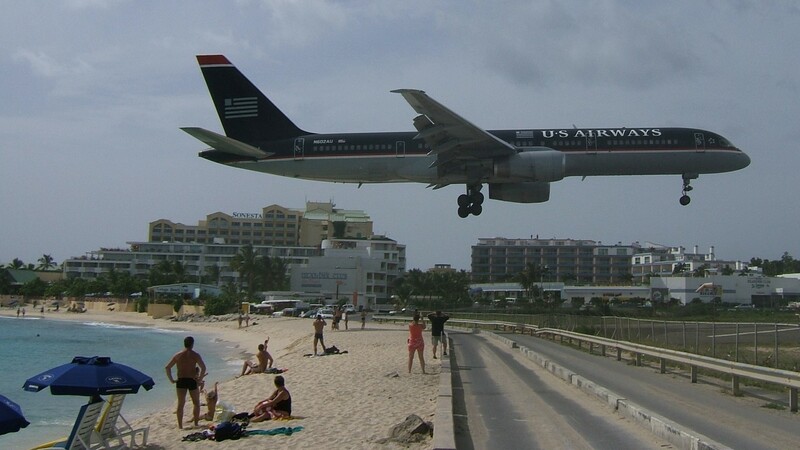 This entry was posted in Uncategorized and tagged airlines, aviation images, aviation photos, aviation pics, boeing 747, boeing 757, jet airplane pictures, landing, maho beach, plane spotting, Princess Juliana International Airport, saint martin, Sint Maarten, St Maarten, st martin, sunset beach bar, sxm, takeoff, tncm on November 30, 2012 by James Sorsby. A Beechcraft Super King Air 350 lands on runway 25 at the Eagle County Regional airport west of Vail Colorado. Located in the Colorado Rocky Mountains, Eagle airport often makes top ten lists of extreme or dangerous airports. This is due to its high elevation, mountainous terrain and unpredictable weather. The approach to runway 25 at Eagle starts at the Kremmling VOR (RLG) 30 miles to the north east. This routing takes aircraft over rugged mountainous terrain that on pretty days can be one of North America’s prettiest areas to fly in. Unfortunately when the weather turns bad it can also be an area which needs to be approached with the greatest of respect. Mountain flying can be rewarding but, treacherous for the unsuspecting aviator. At an elevation of 6,540 feet, Eagle is one of the highest airports in the US and aircraft performance needs to be looked at closely before going. In addition, at the height of the sky season, the FAA imposes a slot system for arriving and departing private aircraft to better facilitate traffic flow. In this video we are flying into Eagle/vail just after the first snow fall of the season. This entry was posted in King Air and tagged 350 king air, aviation aircraft, aviation planes, beech 350, beechcraft 350, eagle airport, eagle vail airport, ege, general aviation, hawker beech craft, hawker beechcraft super king air 350, king air 300, king air 350, king air video, kingair, kingair 350, landing cockpit, mountain flying, super king air, tubo prop airplane, videos aviation on November 27, 2012 by James Sorsby. Video of a Cessna Citation Encore CE-560 takeoff, cruise and landing at Arlington Airport (GKY). On this flight the copilot is the flying pilot. Arlington is about 10 miles south of the DFW airport. Due to its close proximity to DFW, Air Traffic Control requires arriving private jets to descend below the arrival and departure gates of DFW, and then are vectored around DFW to the east. This routing takes arriving aircraft right over the Dallas love airport at a relatively low altitude. In the video the citation flies over Dallas love then turns to the west. At this point the crew gets a Traffic Alert from the TCAS(Terminal Collision Avoidance System) but pass well to the side of the VFR traffic. They then descend and after crossing over the Grand Prairie Airport are cleared for the visual approach to runway 16 and land. Getting into theses smaller general aviation airports where your passengers are closer to their destination is one of the huge advantages to having access to a business jet. This entry was posted in Cessna Citation and tagged air traffic control, aircraft, airport, aviation aircraft, aviation planes, ce-560, cesna, cessna, cessna aircraft, cessna citation, cessna citation encore, dfw, gky, jet air plane, jet planes, landing, takeoff, tcas on November 27, 2012 by James Sorsby.